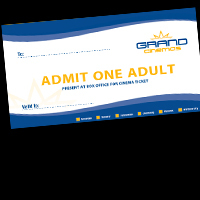 Adult Gift Voucher are purchased at standard ticket prices and can be used for any standard movie, any day, any time. Please note a surcharge is required for 3D and CINEMAX sessions. Not Valid in Grand Cinemas Gold Lounges or special events. 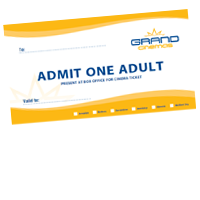 3D Adult Gift Voucher are purchased at standard ticket prices and can be used for any standard 3D movie, any day, any time. Please note a surcharge is required for CINEMAX sessions. Not Valid in Grand Cinemas Gold Lounges or special events. 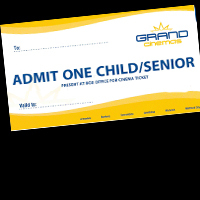 Senior Gift Voucher are purchased at standard ticket prices and can be used for any standard movie, any day, any time. Please note a surcharge is required for 3D and CINEMAX sessions. Not Valid in Grand Cinemas Gold Lounges or special events. Child/ Senior Gift Voucher are purchased at standard ticket prices and can be used for any standard movie, any day, any time. Please note a surcharge is required for CINEMAX sessions. Not Valid in Grand Cinemas Gold Lounges or special events.